When you get stranded, it is not always because your vehicle is broken down. You may be out of gas, locked out, have a flat tire, or some other situation where there is a quick-fix to get you back on the road. Other times, the vehicle may need to be towed. 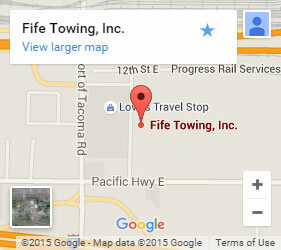 Either way, Fife Service & Towing gets to you quickly with roadside assistance in Federal Way and the surrounding areas. We send out knowledgeable professionals who care about you and your vehicle. Our goal is to treat our customers with the same care we would offer our best friend who calls, stuck on the road—and to do it quickly! Being stranded is not only unpleasant, it can be dangerous. A long wait makes it even more so. With a fleet of towing vehicles and certified roadside assistance professionals at the ready, our 24/7 dispatch routes someone to your aid quickly. Whenever possible we get you back on the road. When it is not possible, we offer residential and commercial vehicle towing services. We have been offering roadside assistance for more than 65 years. Our certified professionals can be trusted with even the larges of heavy loads. No matter the time of day or night, we come prepared and we get to you right away. We offer competitive pricing for superior service. Just check out our many positive reviews! You will see why people consider us the go-to name in roadside assistance. 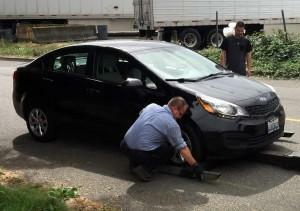 Contact us today for your roadside assistance in Federal Way and the surrounding areas.